There are a number of items we don't leave home without when we travel. . .all are small and would make great stocking-stuffers for that hard-to-shop-for-traveler on your list. * A Picnic Pack: A half dozen small plastic food storage bags, a packet of fancy cocktail napkins, a wine/beer bottle opener and a small cutting knife. (The knife and the wine bottle opener go in the checked baggage). (We buy cheese and fruit and a bottle of local wine at farmer's markets and have picnics in our room or along the way, storing the extra fruit and cheese in the bags). * Souvenir Savers: Wine bottle shaped bubble wrap protectors. (Available at wine stores.) These work well for protecting wine and other glass containers in your suitcase. (I've packed honey and olive oil jars in them to bring home). 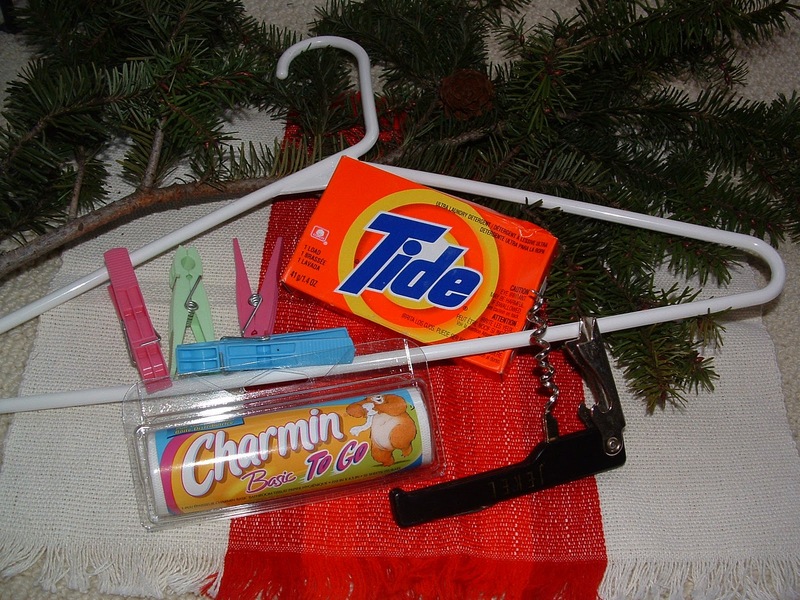 *The Laundry Basket: Plastic clothes hangers, two or three will do, and a half dozen plastic clothes pins and a couple of those tiny boxes of laundry soap (usually found at local drugstores in the U.S.). Eddie Bauer is selling a plastic spork that looks like it might even be something you could get by with in carry on -- guess you would have to check it out and see what you think. They have lots of them at the check out stand in Woodinville. Sounds like a great gift idea to me. I may have to drop by and get a couple for our stockings! Great idea! And if they are small enough they can even go in the 1-quart bag that you can take through security. Lip balm is also a handy one, I had forgotten those. . .thanks for jogging the memory.